^ The Education Of Jeb Bush Florida`s Popular Secretary Of Commerce Joins His Father`s Campaign For President, And Plots His Own Political Future.. Sun Sentinel. ^ Jeb Bush Admits That He's 'Thinking About Running For President'. 哈芬登郵報. 2014-04-23 [2014-04-25]. （原始内容存档于2014-04-25） （英语）. ^ A Note from Jeb Bush. 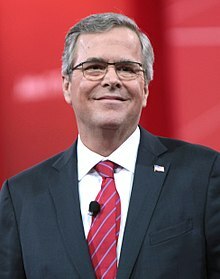 Jeb Bush的Facebook官方個人頁. 2014-12-16 [2014-12-27] （英语）.